"Easy fried apples make a great side dish for breakfast or dinner." Melt butter in a large, heavy skillet over medium heat. 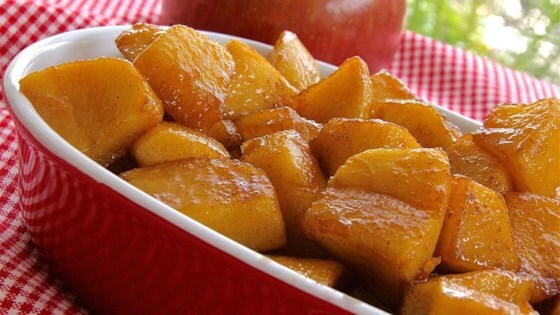 Saute apples, brown sugar, cinnamon, and nutmeg in hot butter until tender and golden, 10 to 15 minutes. Simple, simple, simple!! Didn't change a thing and loved them. My fav part was I didn't have to peel the apples. Thanks for the easy recipe! Reminiscent of the way my Mom cooked apples when I was a kid. Very nice. I butter fried a basic flour tortilla with cinnamon sugar and served the apples with natural vanilla ice cream. I cooked the 8 apples for 14 min. Easy and quick to make. Had all the ingredients on hand already. Kids and I loved it. We eat it plain or mix in some oatmeal for a healthy breakfast. Yum! Great way to fry apples. I use more cinnamon in place of the nutmeg. I use less sugar if my apples are sweet enough.